Books are a pleasure for me; second to gardening with respect to de-stressing. There is something very comforting and settling about holding a book while drinking tea – or sipping wine. I love my IPad mini, but it doesn’t hold a candle to an engaging book or magazine. Garlic, Wine and Olive Oil – a bit about the history and use of three essentials to cooking. I love cooking with wine and sometimes even use it in the dish (paraphrased from a quote often attributed to the incomparable Julia Child). Moosewood Daily Special – our go-to book for soup – cold and hot – and salad ideas. For those of you who are flexitarians, there are recipes that include fish and seafood. And, once you know a recipe, you can figure out how to add meat if you so desire. Small Breads – here is a sampling of bread recipes from around the world collected by Bernard Clayton. It is a subset of his larger book Bernard Clayton’s New Complete Book of Breads. 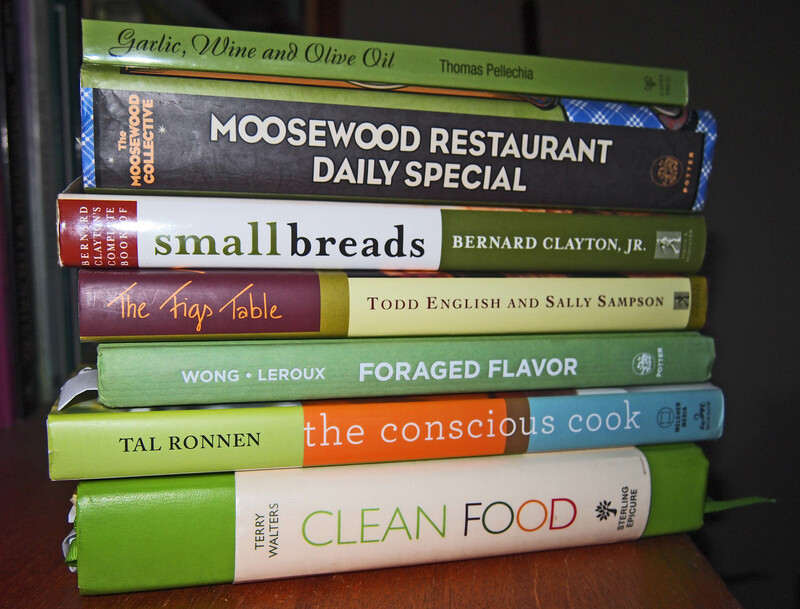 The Fig’s Table – one of many cookbooks that have grown out of famous restaurants. If you like Italian – pizza, risotto, pasta, prosciutto, and more – and you like traditional-eclectic, give this cookbook a try. Foraged Flavor – this weed, uh, plant, is really edible, and how do I use it? That’s the niche that Foraged Flavor fills. This year I will create the Purslane Eggplant Caponata. The Conscious Cook – vegan recipes that do not leave you yearning for meat, and the inspiration for my use of cashew cream instead of dairy cream. This cookbook was a gift and one that keeps on giving (thank you, Denise). And, lastly, Clean Food: a Seasonal Guide to Eating Close to the Source – another meatless cookbook that looks at a sustainable way of eating; for ourselves and for the world. In case you were wondering, a flexitarian is: a semi-vegetarian or a vegetarian who occasionally eats meat. I have said that I am an ovo-lacto-pescatarian, but only if the fish is harvested or farmed in a sustainable way and has low to no measurable mercury levels. This essentially means I eat sardines, herring and farmed trout (and some salmon).